APC is also currently seeking accreditation for its Bamboo Production and Processing for Sustainable Construction and Forest and Water Management courses, which are responsive and relevant to the needs of the Pulangiyen community in taking care of their ancestral domain. Along with the granting of permit to the senior high school program, the DepEd monitoring team also visited the APC schools as part of a series of inspections done annually with non-DepEd schools. 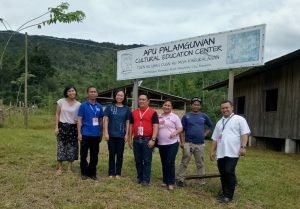 The DepEd monitoring team observed APC’s intervention programs for academically-challenged students, such as the literacy program for non-readers and struggling readers. The DepEd visitors also visited the organic farming facility as well as the bamboo processing facility, where the traditional and chemical-based means of treating bamboo for construction is taught in the bamboo production course.